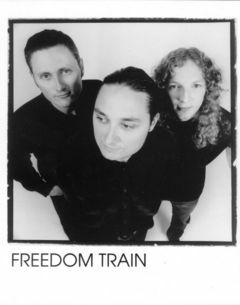 Freedom Train is a versetile, 3-piece rock, blues & funk group of exciting professionals.The versatile vocal range of singer Carl Jennings is showcased in this Hamilton Ontario based power-trio. Few bands are as committed and dedicated to their craft as Freedom Train. Together since 1989 … Carl, Tim & Ed continue to entertain audiences – performing over 200 shows a year! After years of touring and recording as Speck Jennings (releasing a self-titled CD in ’94), the focus shifted to specializing in all styles of Rock-Blues-Funk-Reggae & Oldies. The new direction – Freedom Train. Freedom Train enjoyed immediate success with non-stop booking offers – performing up to 7 days a week! Playing at halls, clubs, corporate shows, weddings and casinos, the band has never looked back – Freedom Train is working just as hard as ever at keeping audiences entertained!